Following up my post from couple of months ago on How can we promote the site for the 2018 FIFA World Cup. Below I've provided the same charts, but updated to show data from June and July 2018 when the 2018 FIFA World Cup took place in Russia. 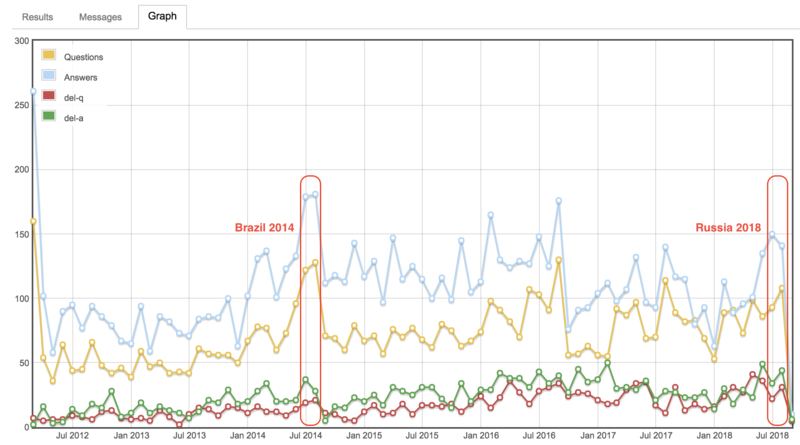 As you can see, during the months of this World Cup, we generated less questions, and answer than the previous World Cup. More precisely, that is 20% less questions and answers. Also interestingly enough, the number of deleted questions and answers raised 30% and 20% respectively. This mean we get less good quality and more low quality questions/answers posted compared to the previous World Cup. Why did we get less good quality questions and answers? This means that we may have not had significantly less soccer/World Cup driven question and and answers. 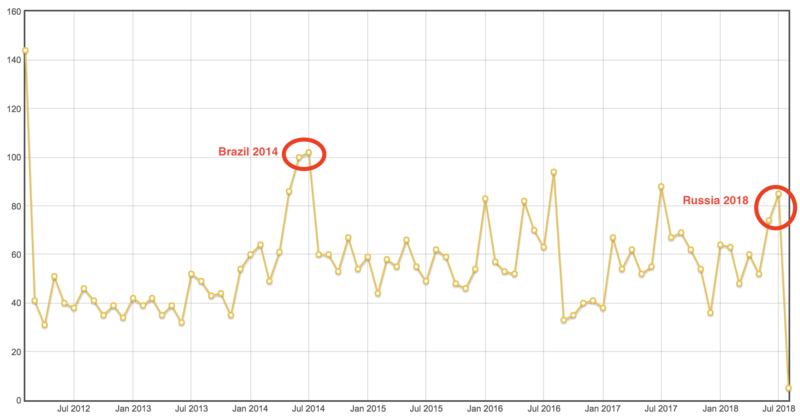 It could be the case that the site did not have that much action in the first half of June and second half of July when the World Cup was not happening. Sports SE is now 6 years old. Most soccer related questions have already been asked, specially given that the rules of the game don't change much over time. Most questions regarding World Cup itself got asked during our first World Cup. Again this is because the general rules of the games (all but the VAR), and World Cup history questions were already covered. So the pool of questions that could be asked was smaller this time around. Why did we get more low quality questions and answers? As Sports SE gets bigger, we're gonna generate greater number of low quality posts and spams. We have more users with higher reputations that are willing to flag and close low quality posts. So we had lower good quality discussions during this World Cup than the previous one, but there were a number of factors that limited the ceiling of traffic (in terms of good quality questions and answers) we could've got. This also somewhat implies that we probably shouldn't expect a huge increase in terms of quality questions and answers for the next World Cup. Or in fact any major sporting event that we've thoroughly covered in the recent years. The Olympics may break this prediction as they host many different sports and far more athletes, so the ceiling of traffic we can hit is much higher. One very important point about this analysis is we're looking purely at the number of questions and answers asked. I'm sure we hit far more views during this World Cup. But that was not the aim of this analysis. There were many posts that had thousands of views in a day, which almost never happens in Sports SE. Overall a lot of discussion was generated during the 2018 World Cup too. Another thing I find interesting is that after the end of the World Cup, the site has been very slow. We're likely going to have very low number of questions and answer asked for August 2018. I'd be interested to see what you guys thing. I think you already explained pretty good why the World Cup 2018 generated less good content. The total number of deletions is probably also impacted by a lot of autograph deletions. I've seen them disappearing a lot lately. During the last World Cup those questions were still allowed. We should just try to focus on the new season... Promote questions about domestic leagues and cups. Many European football leagues are about to start, if they didn't already by now (3. Liga is already on the 3rd game day, 2. Bundesliga started last week, ...) and reaching out to people interested in these should help getting some visitors. Also the Super Bowl attracts a lot of people watching no single game in the NFL. They probably have a lot of questions about American football and just need a nice place to ask them. And even for NFL fans it is a good time as the season is about to start as well (preseason is running). Don't Forget The FIFA World Cup Event Here! Should Questions regarding Unspecified Tournaments be Closed?